As recession-wary Americans adapt to a new frugality, Japan offers a peek at how thrift can take lasting hold of a consumer society, to disastrous effect. 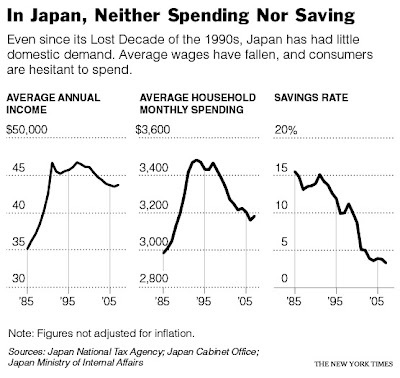 The economic malaise that plagued Japan from the 1990s until the early 2000s brought stunted wages and depressed stock prices, turning free-spending consumers into misers and making them dead weight on Japan’s economy. Japan eventually pulled itself out of the Lost Decade of the 1990s, thanks in part to a boom in exports to the United States and China. But even as the economy expanded, shell-shocked consumers refused to spend. Between 2001 and 2007, per-capita consumer spending rose only 0.2 percent. Now, as exports dry up amid a worldwide collapse in demand, Japan’s economy is in free-fall because it cannot rely on domestic consumption to pick up the slack. .... the average worker’s paycheck has shrunk in recent years, even after companies rebounded and bolstered their profits. Younger people are feeling the brunt of that shift. Some 48 percent of workers age 24 or younger are temps. These workers, who came of age during a tough job market, tend to shun conspicuous consumption. Young Japanese women even seem to be losing their once- insatiable thirst for foreign fashion. Louis Vuitton, for example, reported a 10 percent drop in its sales in Japan in 2008. I'll keep repeating this - this is not cyclical, this is structural. This is a sea change. People are still in denial of the scope of it all. Thankfully we're are not following Japan's example, or else I'd be concerned. Second half 2009 economic recovery....right on target.